Claire Young explores her family’s journey through the diagnosis of her son George, who lives with Batten disease, a form of childhood dementia, and the challenges they’ve overcome and lessons they have learned along the way. Could you explain how George came to be diagnosed as having childhood dementia? George was developing normally until the age of about two, hitting all of his major milestones until about that age, except that his language skills were a bit slow. He was given help and support for that, but it was just put down to boys developing their language skills later, which is quite common. But then, in October 2016, when he was three, he started having seizures and then the doctors diagnosed him with epilepsy. However, it was diagnosed in the context of it being part of a bigger condition. They did some more testing over a couple of months, and were able to diagnose Batten disease in February of 2018. Did the emergence of George’s symptoms come as a surprise? It was a shock because the seizures seemed to come out of nowhere – it wasn’t a gradual occurrence, it was over the space of a month that they emerged and became more frequent. It came out of nowhere and I hadn’t heard of the condition – it was a massive game changer, obviously, when you receive that kind of news about your son. What was the process of receiving George’s diagnosis? 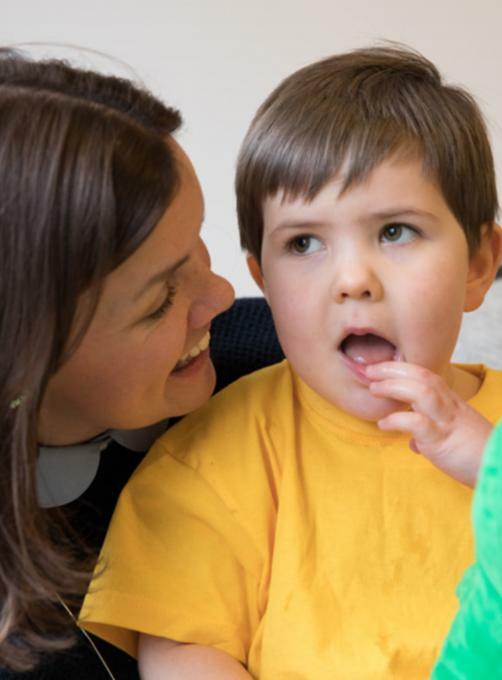 We had excellent support from Birmingham Children’s Hospital and our consultant there was particularly interested in Batten disease so he was able to channel all of the testing that was done on George in a particular direction. This allowed us to receive a diagnosis for George very quickly. More broadly, how has support for George and yourself been since his diagnosis? We got great support from our consultant, as I mentioned, and then following that we engaged quite quickly with the BDFA (Batten Disease Family Association), who then gave us excellent signposting on where to get help from and how to source equipment. On a medical level, we’ve also received incredible support from our community and the NHS. George has amazing professionals who support him on the weekly basis, from his community care nurses to physiotherapists – we have a spectrum of disciplines that support him. We couldn’t have got through the past year without their help and support. The condition affects so many different aspects of his life, he needs that specialist support. It’s been invaluable. What are the symptoms of George’s condition and are there any treatments, either now or on the horizon? There aren’t currently any treatments for Batten disease but there are some groundbreaking treatments that are being trialled in London; there are amazing children, who have slightly different genetic variants of Batten disease to George’s, that are undergoing those trials and leading the way in making those treatments available for other affected children. Due to George’s genetic variant, there are no clinical trials available. But the children that are currently on the trials are showing positive results and the hope is that this will continue. Ultimately, the aim is for that treatment to be expanded across other variants of the condition so that more children can get the benefits of it – but it is still at the very early stages. In terms of symptoms of the disease, he is affected right across his skillset; he can’t walk or run anymore, he has no language and his swallowing reflex is failing; he may also lose his sight and obviously epilepsy is part of the condition. Due to it being a dementia-related condition, it impacts his general development and learning capabilities so his memory is affected and he becomes confused quite easily – this makes routine very important for him. It really is all-encompassing for him, there’s a lot for him to deal with and adjust to. Do you think the routine helps you, as well? I think the routine definitely helps both of us. It’s definitely a day-to-day thing, with some days being better than others. George just ploughs on with such courage and determination that you can’t help but do the same. Any parent would be doing exactly the same for their child, you just have to get on and do the best for them. How are you making the most of your time with George? Well, we’ve put together a bucket and spade list for him of different activities – places and activities that we want to do with him to make lots of lovely memories and give him the best experience possible. Last year we had George riding a helicopter, he got to go for a ride in a very fancy sports car and he was on a speedboat. He’s a typical a boy, they like that sort of thing. We also went to Peppa Pig World and went on all of the rollercoasters there. Did you have help getting George to achieve all of these activities? It was the generosity of friends and family that allowed George to do all of these things, which is just amazing. We’re incredibly thankful to have such supportive people in our lives to allow us to make our memories together. The Make-A-Wish charity is helping us to achieve another one of our items this year so we’re excited about that. We’re going tobogganing, again following the same theme! I wanted to do something exhilarating with him to get him excited because, despite not having any language, he is able to show his excitement and laugh so I want to do activities that will do that for him. We’ve had support from all across the spectrum. George participated in a recent campaign in London to spread awareness of childhood dementia – what do you hope are some of the outcomes of this? The big message is awareness and to make sure people know that this condition exists. For that to drive clinical education into rare diseases and these particular dementia conditions, like Batten disease, so that clinical diagnosis can be made much earlier. If children are diagnosed much earlier then they can receive treatment at an earlier date. We were lucky having the diagnosis for George only take a few months but, hearing the experience of other families, we were in the minority; most families were waiting more than one or two years longer than that to have a full diagnosis and, in some cases, the child has deteriorated so much that a treatment that could have worked is no longer viable. It’s incredibly important to raise awareness of the condition. Is there any advice you’d give to any parents who find themselves in a similar position to yourself? I’ve had a lot to learn. The last few years have been a massive learning curve, both practically speaking – understanding all the medicines and equipment George needs to have – and an emotional time, as well – there’s been a lot of ups and downs. I’ve learnt to just make the most of the time I have with George, and I know it’s a cliché, but life is short. It’s brought into crystal clarity when you have a terminal condition affecting your son – it brings that home. In terms of advice, I’d tell people to make sure that they’re accessing all of the local services that are available to you to give you the support that you will need, but mostly just to enjoy the time you have with your child, just like any parent.